At DHANLAXMI Packers and Movers Cell No. : 9587306001, 9587346001 is the best packers and movers service transport company in western Rajasthan. You will get full assistance, starting from packing and loading of your all contents in your home and offices to delivering and unloading. All these types of activities are performed by our highly trained professionals team under the guidance of our experts. Beside this, we also look into the associated issues, like sales tax, insurance etc. Since all the consignments dispatched by us are protected, so you can rest assured of damages free and well protected delivery. 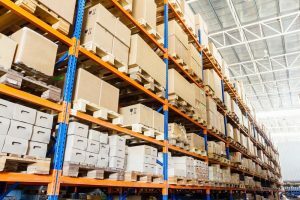 Any transport service company and logistic service company without a strong and adequate manpower is far behind from reaching the next level. To be the best logistic service providing company, DHANLAXMI Packers and Movers focuses on building a robust and skilled team member. Our team consists of a group of industry leaders including hundreds of people connected directly or indirectly for quick solutions, our staff are passionate about providing world class services, our team trained in all domains of transportation. We at DHANLAXMI Packers and Movers are committed to updating and training our staff in their department of functioning to retain the position of best movers and packers service. 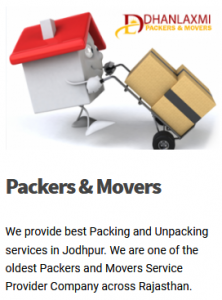 In order to ensure a systematic, organized, and professional packing and moving, DHANLAXMI Packers and Movers has established a state-of-the-art infrastructure and a well-connected network of several offices in western Rajasthan as a part of its business expansion. We have also designed our office with modernizing infrastructure in order to facilitate 24×7 real time tracking of goods which is on move. Besides, being the best packers & movers service and the best logistics service providing company, we have a fleet of hundreds of vehicles and cubes, ultra-secure warehouses in order for the fast, easy and secure movement of commodities. We provide customized packing materials for safe packing and transportation of your goods. Currently, we provide our best transport service in the western Rajasthan which includes Bikaner, Barmer, Pokhran, Jaisalmer, Udaipur, Pali, Sirohi, Jalore, Bhinmal, Sumerpur, Balotra, Kharia, Gotan, Nagour, Jaipur, Ajmer, Jodhpur cities. Our mission has always been to provide you on-time delivery of goods using modernize technology with utmost and efficient care. We can make you sure about a reliable and hassles free assistance. 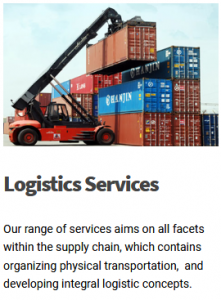 So for this, we have amended the use of packing materials of advanced techniques and step up the standards in moving and shifting procedure to ensure you are with the best logistic service providing company. At DHANLAXMI Packers and Movers, you can get a complete service, starting from packing, loading and unloading households as well as industrials goods and transportation to your desired destination. As an independent service provider for packing & moving and the best logistic service provider, we have considerable expertise in this area and thus we have achieved a high rank in the industry. In western Rajasthan, we are respectively renowned for the best logistic service and specializing in the household and corporate contents transportation and providing clients with quality and reliability, the plethora of efficient moving services in the domestic land. Staff at DHANLAXMI Packers and Movers executes some of the tasks including creating new plans for pre-departure of all the items, ensuring professional packing and crating, ensuring the best transport service with our well-tuned and sturdy vehicles. We as the best movers & packers service and the best logistic service provider, not only expert in packing and loading, but also you can place reliance on our service of transportation, delivery and unloading items. Our professional team can very carefully deal every required step to complete the process starts from arranging everything like vehicles, packing materials, loaders and experienced professionals who put their full effort for a safe and well protected packing and moving. Our facilities provided on domestic or local shifting includes Packing & Unpacking Service, Storage / Warehousing Services, Car Carrier Services, Relocation Services, Household and & Corporate Shifting Services, Car Transportation Services. DHENLAXMI Packers and Movers is also known for handling the sensitive assignment of glassware, electronic packing. We are well knowledge and well focused on such items. Due to a wide network area, all moving goods reached the target destination without any harm and damage but with a personal and professional touch. At the initial moment of every shifting, we discuss the full planning with our clients to make sure hassle-free and 100% safe, convenient and on-time local shifting or domestic relocation.